Over the last week or so I've been in contact with one of my favorite youtube gurus, MissChievous. If you're seen her videos, you know that she is amazing when it comes to makeup...just simply amazing. I asked her if she wanted to collaborate on a Halloween look. 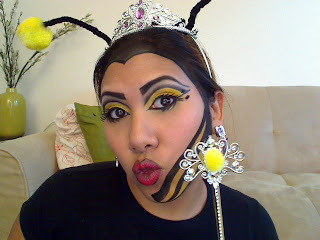 She suggested a bug theme because she wanted to do a Ladybug look and had another request for a bee look. At first I was a bit stumped. A bee look? I googled pictures and found that bees just have a plain black head. I decided to take a more artistic approach. 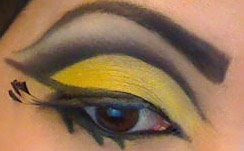 I used the colors of yellow and black and decided to create shapes on the face similar to the bee's stinger and stripes. I like how it came out! 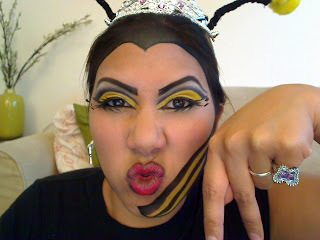 My boyfriend gave me the great idea to do a Queen Bee look, and to take a cheap crown and attach antennae to it. A quick trip to wal-mart for a princess crown kit, some pipe cleaners and pom poms and I had my look! Check out MissChievous' Lady Bug Tutorial! I used a lot of the same products for both the eyes, faces, and lips. But I went ahead and showed you the products I used for each area of the face, so please excuse the repeats. oh my goodness that is PURE creativity!!! I love it!! you look so cute ren ren! 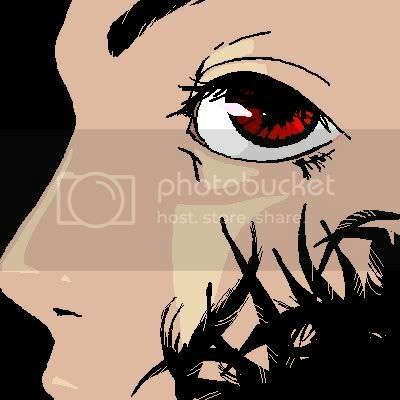 thats sOOoo coolllllllll!!! thats a lot of work for me =( but mee like! love it... i love cutting the crease. i've only tried it once and need to try it again. inspiration! congrats again on the billy b brushes! Hi Ren Ren, I've been reading your blog for ages now and I felt compelled to leave you a note to compliment you on your amazing artistry! It's absolutely creative and unbelievable! You must have taken nearly an hour to do this. I really must salute you for the effort! Rock on! brilliant!!!!! you might make me change my mind about not dressing up for halloween! 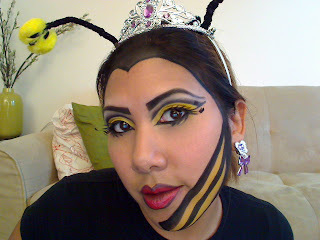 Who would of ever thought to do cute BEE MAKEUP!! Only REN!!! I love it! You're so cute not to mention creative! You go girl!! Freaking cool RenRen!Hot Hot Hot! Really fantastic. I'm from Canary Islands, I have a custume of bee, and I need to invent a make up, YOU'RE GREAT, you're welcome to live our party.